08 06 2009 - With 7,1 percent of the vote, the Swedish Pirate Party has shocked its critics and secured a seat in the European Parliament. The Pirates received more votes from those under 30 than any other party in the European elections yesterday, and this was celebrated with pints of rum and loads of pirate chants. Late Sunday night, Swedish Prime Minister Fredrik Reinfeldt congratulated the Pirate Party on their unprecedented win at the European elections. The Pirate Party is seen a serious competitor in Swedish politics now, a fact underscored by the Prime Minister who said that his own party will formulate a clear policy regarding net integrity and copyright issues in preparation for the Swedish national elections in September 2010. A few hours earlier, the party dinner had come to a close with volunteers and members singing “The Broadband Hymn”. They had fittingly gathered at the Royal Institute of Technology in Stockholm, and as Swedish TV published the exit polls results indicating that the Pirate Party would get around 7% of the votes, wild cheers broke out. Party leader Rick Falkvinge took to the stage. And yes, it did. 214,313 of them in Sweden on Sunday. 7.1 percent of the vote and a guarantee of at least one seat in the European Parliament. The Pirate Party was the most popular party among voters under 30 years of age. Taking into account that Prime Minister Fredrik Reinfeldt’s Moderate Party is the most popular party among voters over 65 years of age, one can understand why Reinfeldt later in the evening said he will sit down with the Moderate Youth leader Niklas Wykman - a critic of the surveillance legislation and anti-filesharing laws - to discuss Internet issues. “We’ll share files in Brussels!” a young man shouted as he ran to the bar at election night. Meanwhile, journalists from all over Europe who had flown in to cover the unique occasion tried to get their piece of party leader Rick Falkvinge and vice chairman Christian Engström. The latter, who will probably take the party’s seat in the EU parliament, held a short speech in which he thanked all the volunteers. 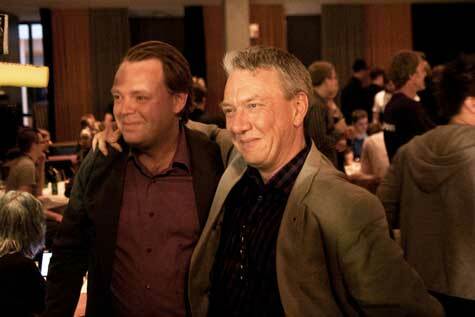 The Pirate Party stays true to its net-roots and has no formal organization. Anyone who thinks he or she can contribute is welcome to do so simply by posting on the forum and going out and doing it. No formal decisions on campaigning are taken and the thousands of party ballots have been distributed to voting centers simply by someone living close and wanting to play their part. “It’s amazing that it worked. I never thought it would,” Engström joked. Today, after a night spent drinking rum and chanting seafarer standards, the pirates woke up finding themselves on the front pages of the Swedish newspapers. Pirates waving Jolly Rogers. Pirates taking celebratory late night dips in fountains. Pirates laughing. Pirates hugging. And there is consensus among the op-eds and political pundits on how it could happen: Enthusiasm paid off. The two large parties in Sweden, the Social Democrats and the Moderate Party, are heavily criticized because of their lack of engagement in the European Parliament. Meanwhile, the Green Party (which also had a great election with 10.9%) and the Pirate Party positioned themselves on their respective expert issues and built a lot of support from the base. When the EU parliament meets after summer, there will be at least one pirate in the midst of European parliament. If the Lisbon treaty is voted through, there can be two. It may not seem a lot in order to make a difference, but as a blogger put it: One pirate can hijack a whole ship.